Folk Literature has existed for thousands of years, orally handed down from generation to generation. Most folk literature consists of stories in the form of fairy tales, fables, folktales, legends, and myths. But it can include nursery rhymes, proverbs, riddles, songs, superstitions, holiday, and religious celebrations. Folktales deal with customs and beliefs of people in the real world, and are told as true stories about animals or human beings, always full of fantasy and magic. Fables are short stories told with animals and usually contain a moral or lesson. Most of the characters are animals and objects that talk and a ct like human beings. They remain popular because they illustrate truths that everyone can recognize. Fairy tales occur in some imaginary land and are told as fiction. They speak to the heart and soul of a child because they appeal to a child's courage and confidence by offering hope. Fairy tales always end happily, wickedness is punished, and virtue rewarded. Myths are historical stories that deal with the supernatural traditions and beliefs of people. They differ from most types of folk stories because they are considered to be true among the people who develop them. Legends are stories that revolve around a person who may or may not have lived. Like myths, they are told as true stories, whereas legends are set in the real world. We hope that you will enjoy our selections. illus. by Jerry Pinkney, (Little Brown & Co., $16.99, ISBN 978-0-316-01356-7), 40p, Ages 3-6. In a nearly wordless interpretation of the popular Aesop's fable, Jerry Pinkney's marvelous rendition takes place in Africa. An adventurous mouse escapes the claws of a hungry owl, only to accidentally disturb a sleeping lion. Trapped in his paws, mouse is graciously freed to live another day. 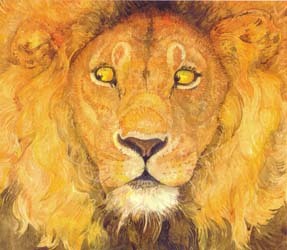 When she later comes upon the lion, caught in a hunter's trap, she remembers the lion's kindness and nibbles his ropes. The little mouse returns home with a piece of rope for her babies to chew. Endpapers show the mouse and her babies resting on the lion's back for a family outing. Artist's Note explains his concern and reverence for animal life. "It seemed fitting, then, to stage this fable in the African Serengeti of Tanzania and Kenya, with its wide horizon and abundant wildlife so awesome yet fragile–not unlike the two sides of each of the heroes starring in this great tale for all times." As always, Jerry Pinkney's illustrations are delightful. retold/illus. 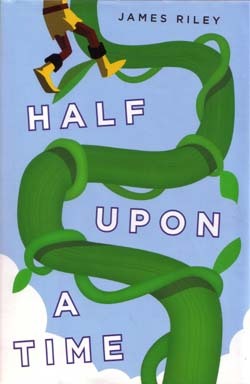 by Ruth Sanderson, (Little, Brown & Co., $16.99, ISBN 978-0-316-77885-5), 32p, Ages 4+. "Goldilocks loved to pick blueberries. That morning, she wandered from bush to bush to bush, and before she knew it, she was standing in front of a cottage she had never seen before." Forgetting her manners, Goldilocks creates a mess by eating the inhabitants' porridge, breaking their chairs, and sleeping in their beds. 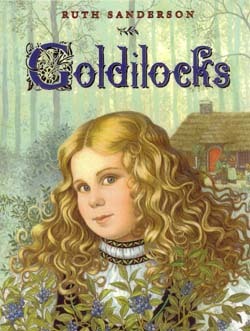 Confronted by the bear inhabitants, Goldilocks is embarrassed by her rudeness and makes amends by straightening up and helping around the house with chores. Offering the bears her bucket of blueberries, they all pitch in to make blueberry muffins. Endpapers offer a delicious recipe. Of the numerous renditions of Goldilocks, this interpretation, with its delightful twist and happy ending will appeal to a new generation. 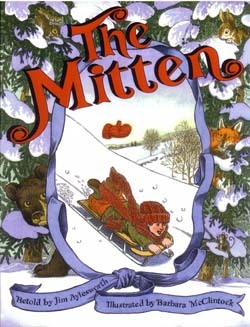 Children will love this charming adaptation of a famous old Ukrainian folktale, where a little boy plays outside in the snow so boisterously that he loses one of his mittens. However, the animals that find warmth and protection inside it are absolutely delighted with their discovery. "The squirrel found the mitten quite warm and very comfortable, and soon he was so nice and toasty in there that he fell sound asleep." A passing rabbit squeezes in, then a fox, and finally a bear share the very cramped mitten, now stretched to the breaking point. When a small mouse begs for entrance, the animals protest that there is no room, but they finally relent and admit the mouse. As they take a collective breath, the mitten explodes into pieces. The animals are very disappointed and search for another place to warm their toes. The boy and his grandmother return the next day to discover a mitten in shreds. Grandma cheers up the boy by promising hot chocolate another knitted mitten. The whimsical artwork and delightful tale will have children begging for more classic folktales. In a humorous twist on Aesop's fable, "The Fox and the Grapes", fox spies mouth-watering grapes on a vine high in a tree. Priding himself on his cleverness, he gathers paper, pencil, and graphs to calculate a method of reaching the luscious grapes. He tells Possum, "Here's the plan. Bear stands—here. Beaver stands on Bear's head—there. Porcupine stands on Beaver's tail. I stand on Porcupine. You stand on me … and voila! Grapes!" Each animal tries to convince fox of a simpler plan, but ignores their ideas. When all his calculations yield no grapes, fox gives up and stomps off, stating, "I, for one, wouldn't think of eating those lousy, rofox rotten, stinkin' grapes now, even if I could." 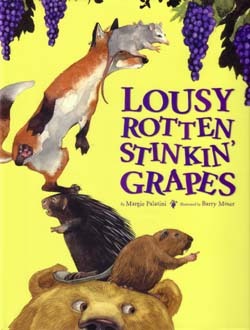 The other animals are shown enjoying the grapes thrown down by Possum, who climbed the tree to pick them. Readers and listeners will enjoy the expressions of the doubting animals trying to accommodate the prideful fox. written/illus. by Sylvia Long, (Chronicle Books, $17.99, ISBN 978-0-8118-5522-8), 58p, Ages 4-8. From Hans Christian Andersen's beloved tale comes Sylvia Long's exquisite version of a girl no bigger than a thumb and her adventures with an ugly toad, his mother, pond fish, graceful butterflies, disagreeable beetles, field mice, and a gloomy mole. When Thumbelina nurses a swallow back to health, he remembers the kindness and delivers her from an arranged marriage with a dreary mole. Flying with Thumbelina on his back, the swallow delivers her into warmer country where she meets and marries the prince of fairies. "During his long travels, the swallow sang the story. A storyteller in Denmark named Hans Christian Andersen heard the swallow's song. 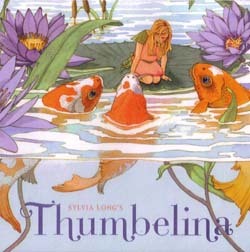 He wrote it exactly as it happened, so that all the children would know of the adventures of kind and lovely Thumbelina." As always, Sylvia Long's illustrations are exquisite in this classic tale. 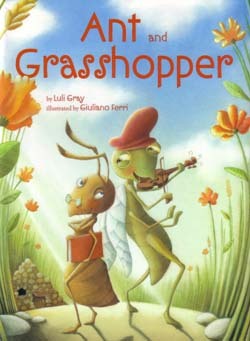 Aesop's tale of an industrious ant, a fun-loving grasshopper, and the rewards of hard work is developed further into a tale of kindness, compassion, and friendship. Rich and hardworking Ant cares little for Grasshopper's musical talent and criticizes his negligent ways. "All summer long Ant worked hard. Every afternoon he counted his beans, and his raisins, and his cheese. And all summer long he heard Grasshopper playing his fiddle and singing. Sometimes the music got into Ant's head and made him lose count." As the season changes into winter, a cold and hungry Grasshopper is turned away by Ant. A guilty conscience and bad dream spur Ant to open his home to the freezing grasshopper. Over the winter a friendship develops as Grasshopper learns the merits of hard work and planning, and Ant learns to appreciate the arts and sharing. 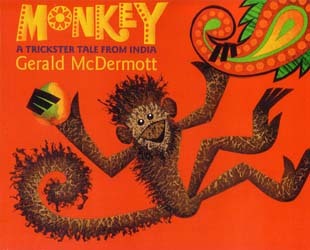 In this sixth and final tale in Gerald McDermott's trickster series, Monkey desires mangoes, but cannot swim across a river to the island where they grow. Crocodile, thinking of his next meal, offers to carry him across the river, however, realizing Crocodile's purpose, Monkey tricks him into returning to the river bank. The mangoes still beckon, so Monkey finds large rocks to jump across the river, where Crocodile awaits disguised as a rock. Will Monkey escape Crocodile's sharp teeth a second time? The author explains that this trickster tale is from the Buddhist tradition, and "is part of an ancient collection of folklore, fables, and legends called the Jataka tales, which originated in India in the third and fourth centuries B.C. and circulated throughout Southeast Asia for thousands of years." 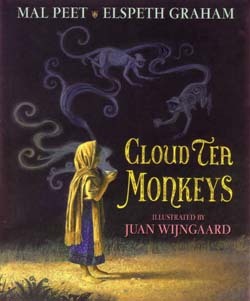 Inspired by a Chinese legend of Himalayan tea-picking monkeys, this richly told tale surrounds a young girl, a tea plantation, a bad-tempered overseer, mysterious Cloud Tea Monkeys, a Royal Tea Taster, and a faraway Empress. Each day while Tashi's mother works in the tea fields, she slips off to share her lunch with wild monkeys. When her mother becomes ill and cannot work, Tashi tries to earn money by taking her mother's place in the fields. Scorned by the overseer and desperate, Tashi explains her dilemma to the monkeys, who disappear into the cloudy mountains to pick the rarest tea in the world for her. The tea leaves impress a visiting Royal Tea Taster, who pays her handsomely in gold coins with the promise of more each year. Vivid, expressive illustrations complement this simple, elegant, and memorable tale of kindness. witten by Mike Artell, illus. by Jim Harris, (Dial Books for Young Readers, $16.99, ISBN 978-0-8037-2816-5), 32p, Ages 5-8. "If you like dem stories, I got one fo' you / About a young boy who live down de bayou. / Dey call dis boy Jacques and he live in a house / Wit' his old MaMA and a little brown mouse." 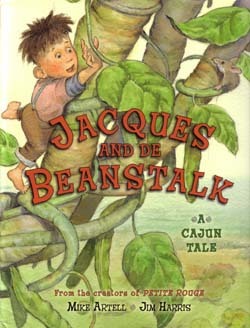 In this Cajun tale of "Jack and the Beanstalk", a poor boy is sent to sell the family cow for needed money but is tricked into a trade for magic beans, which grow into a huge beanstalk reaching to the sky. Upon climbing to the top, Jack discovers a chicken that lays golden eggs and a giant determined to eat him for desert. Escaping down the beanstalk with the chicken and chopping it down, Jack and mom are never poor again. "And things sho' were different fo' everyone den. / 'Cause Jacques let MaMA have dat magical hen. / MaMA treat dat hen like it's her favorite pet. / Dat hen lay more eggs than she ever did yet." Those who attempt this lively Cajun rhyming text will be rewarded with a fun and hilarious read-aloud. A suggested technique for reading aloud as well as a short glossary is presented at the front of the book. An angry, selfish, hungry, and rotten Ogre believes that his life is perfect. He rampages through the country, snacks on the citizens, and wreaks havoc, until one day he comes across a beautiful girl watering her flowers. Seeing beyond his offensive odor, repulsive appearance, insufferable manners, and terrible reputation, she assumes the best in him and offers tea and muffins. Unaccustomed to kindness, Ogre tries every trick to frighten her, but nothing changes her positive outlook. Frightened by her generosity and disbelieving her kindness, the Ogre staggers away and breathes his last breath. The townspeople celebrate, but as for the girl, "She also understood that the terrible things that can happen when you come face-to-face with an Ogre can sometimes happen to the Ogre and not to you." After a 49-year absence, author and illustrator reunite to offer a remarkable read and delightful tale of kindness overcoming bullying. 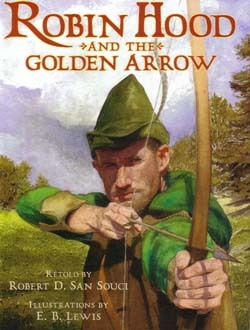 Based on the traditional British ballad "Robin Hood and the Golden Arrow" and Howard Pyle's 1883 novel The Merry Adventures of Robin Hood of Great Renown in Nottinghamshire, San Souci's tale surrounds the Sheriff of Nottingham's plot to capture Robin during an archery contest with the prize of a golden arrow. Disguised as a beggar in rags, with eye patch and dyed hair, Robin participates, beats the sheriff's favorite archer, and wins the arrow. Robin has the last laugh when he shoots a poem into the sheriff's window. "Your Lordship, now the tale is told, / From highest hall to deepest wood— / That today you gave your arrow of gold/To the greatest archer—Robin Hood." The powerful and realistic illustrations are delightful. 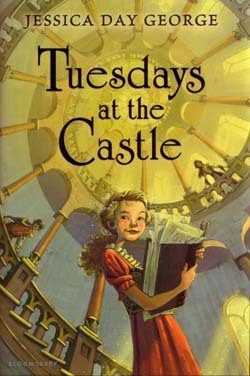 11-year-old Princess Celie and her family live at Castle Glower, a whimsical and magical castle that creates, alters, and shifts rooms, stairways, and corridors on Tuesdays. When her parents and oldest brother are ambushed and presumed dead, Celie and her remaining brother and sister fend off a foreign prince, who desires the crown, and treacherous castle Councilors, who seek to overthrow the royals. Having explored and mapped the castle for years, Celie and her siblings play pranks and create obstacles for those who seek to destroy the family. Always protective of Celie, the castle joins in the fun, until it falls under a wicked spell, and only Celie can save her beloved protector and defeat the enemy. Magical transformations, political intrigue, and comical escapades make this charming fantasy a fun adventure in reading. The town of Hamelin is plagued with garbage, abandoned children, corrupt officials, and the uncaring wealthy. When rats overrun the town, a mysterious piper offers to rid the rats for a fee. The mayor agrees, and the Pied Piper blows a tune on his silver flute to induce the rats to follow him to the river Weser where they drown. When the mayor reneges on his promise, the Piper takes revenge and lures the children away by playing a tune. 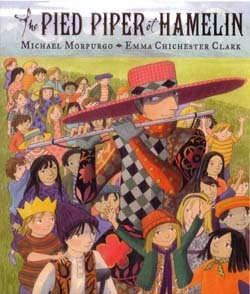 In this retelling, the Pied Piper promises to return the children in a year and a day, if the town cleans up the garbage, builds parks and schools, instills fairness and kindness, and eliminates poverty. Finally, the repentant mayor and townsfolk decide to right their wrongdoings. As the narrator explains, "The shantytown and the garbage heaps disappeared first. Soon we had built enough proper houses for every family in town. We laid out the park, built a school. No beggars walked the streets anymore, and the sick and old were lovingly cared for." With themes of morality, social, and environmental issues, this retelling should provide plenty of fuel for discussion. "Once upon a time, Jack wouldn't have been caught dead in a princess rescue. Yet there he was, in the middle of a cave—a dark and stupid cave—on his way to do just that." Ever since the incident with his father, the beanstalk, and the giant, Jack is training to restore his family's reputation by rescuing a princess. Things aren't going well, until one falls from the sky from another dimension in search of her kidnapped grandmother, Snow White. As Jack and May set out on a journey to find the missing grandmother, they acquire a handsome and competent prince. 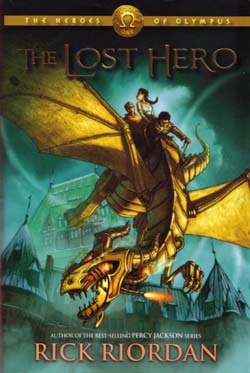 Staying ahead of a huntsman, who is trying to kill them, they travel through the Black Forest, hitch a ride on a wicked wolf's back, break Red Hood's magic mirror, and accidentally release a genie. When captured, they spend time in the dungeon of the Fairy Queen, before finding Snow White and the seven dwarfs in the Palace of the Snow Queen. A bewitched storybook, magic mirror, flying broom, a genie, and a giant, along with famous fairy tale characters, magical creatures, a magical sword, combine to make this take an exciting read. Snappy dialogue, fast-paced action, surprising twists, conflicts between three teenagers, and an unexpected ending will have readers eagerly awaiting a sequel. 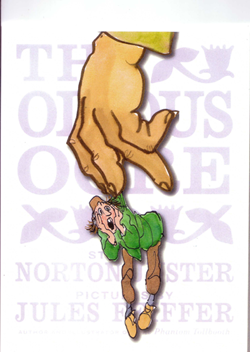 The only witness to the departure of Swinley Forest's sole unicorn is a young fairy, Joyce, who is given the responsibility of retrieving the animal from Buckingham Palace. Uncertain of her ability to fly long distances, Joyce wonders about crossing the sky alone. "She looked up at the tiny patches of sunset that showed through the dark leaves and remembered how terrifyingly big the sky had looked at the edge of the forest." 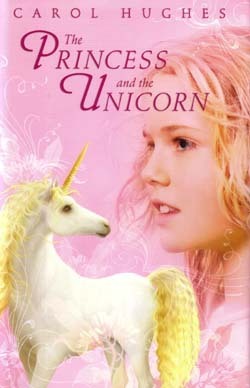 Ten-year-old Princess Eleanor, only child of the British King and Queen, discovers the unicorn during a royal hunt and takes him back to the palace at the instigation of her evil governess, who is interested in selling the unicorn for profit. As both the unicorn and the forest begin to die, the two girls work together with humans and palace fairies to thwart the greedy governess and return the unicorn to its forest home. Overcoming hurdles in both the human and fairy world, they encounter rigid rules, unbending attitudes, evil adversaries, and discover loyalty and friendship. Based on the Sleeping Beauty fairy tale, Helen Lowe has created a brave and courageous prince, who dreams of a forbidden wood, an enchanted castle, and a sleeping princess that is under an evil spell. Little does Prince Sigismund realize that he is part of the story, which begins in a remote kingdom where eleven-year-old Sigismund meets an unusual master-at-arms. Balisan is a teacher and mentor sent by the King to train and prepare him for a future quest—a quest involving a Hedge of Thorns, the evil fairy Margarine, a ragged and elusive girl, a sleeping kingdom, a priceless sword, and a special dragon. Through the years, Sigismund matures in wisdom and knowledge, and at eighteen he prepares for the final battle against evil, which he discovers can sometimes be hidden behind the mask of friendship. He not only rescues a kingdom and a princess, but also discovers a future beyond his wildest dreams. For those who love quests, magic spells, and enchantment, this tale is sure to please. Based on the famous Grimms' fairy tale, The Twelve Dancing Princesses, Jessica Day George spins an engaging tale about an honorable young soldier, twelve enchanted princesses, an evil King, an invisible cloak, knitting needles, a magic rug, and a silver forest. 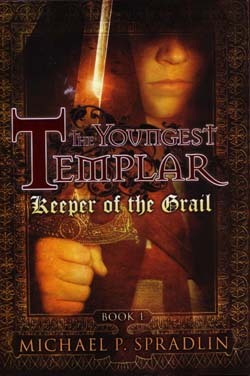 Returning from a lengthy war, young Galen is taken in by his uncle, the King's head gardener. He eventually meets Princess Rose and her sisters, who mysteriously disappear each night to dance at the Midnight Ball for the evil King Under Stone and return each morning with worn out shoes. 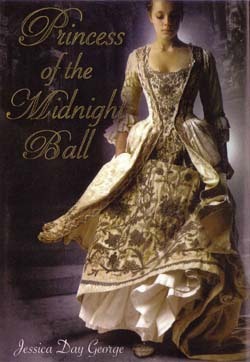 Determined to break the spell, Galen uses information and possessions given to him by an old woman, and follows the princesses for three nights. Working together, Galen and Rose break the spell, defeat dark forces above and below ground, save the kingdom, and find true love. This tale of heroism, perseverance, and love will leave readers yearning for more retellings of classic fairy tales. Endpapers contain a short history of men who knit, patterns for knitting items used in the story, and a Pronunciation Guide to German names. Left on the doorstep of an English Abbey as a baby and raised, by monks, fifteen-year-old Tristan dreams of seeing the world and discovering the truth about his past. When the Templar Knights come to the abbey on their way to fight with King Richard the Lionheart and free the Holy Land from the Saracens, Tristan becomes a squire to Sir Thomas, one of King Richard's most respected and courageous knights. Thrust into political intrigue and rivalry, Sir Thomas entrusts Tristan with the Holy Grail, one of the most sacred Christian relics, to return it safely to Britain. Together with a King's Archer from Sherwood Forest and a dangerous Hashshashin warrior (a girl), they outwit and outmaneuver prison guards, bandits, Saladin forces, and unscrupulous knights, who desire to possess the Grail. Whenever in extreme danger, the Grail becomes Tristan's protector. "The last thing I remember was a large piece of wood from the mast catapulting through the air, headed directly for me. I tried to dive below the water, but I felt it slam against my head and shoulders. After that I remember almost nothing. Nothing except a faint humming sound coming from somewhere I could not determine. I only knew it was familiar and comforting." A mystery still surrounds young Tristan's real identity. When he overhears a conversation between two sparring knights, it leads him to believe that there is more to his real identity and mysterious past than he ever suspected. For those who love action-packed adventures and historical fiction, book two cannot come too soon. "Even before he got electrocuted, Jason was having a rotten day." Thus begins a new series, incorporating a few characters from the Percy Jackson and the Olympians series, and featuring three new heroes from the Roman side of mythology: Jason, whose memory has been burned away, Piper, with a powerful gift of persuasion, and Leo, clever with his hands at building things. The three are kidnapped while on a field trip to the Grand Canyon and are taken to Camp Half-Blood, where they discover that the gods are silent, Percy Jackson is missing, and they must begin a quest to rescue Hera, Queen of the gods before a giant king destroys Olympus and their world. Jason, son of Jupiter, Piper, daughter of Aphrodite, and Leo, son of Hephaestus must learn to work together flying across the states on a 60-foot mechanical dragon and match wits with Medea, King Midas, and the cannibal Enceladus. A new prophesy is revealed that will be continued in the next four installments in the series: "Seven half-bloods shall answer the call / To storm or fire the world must fall / An oath to keep with a final breath / And foes bear arms to the Doors of Death." Cliffhanger danger and unexpected humor will have kids eagerly awaiting "The Son of Neptune." "What know you of magic lamps—of the demon jinn who dwell within brass walls? Draw near, my friends, and I, Idris–the master spinner of tales—will amaze you with a saga the likes of which you've never heard." 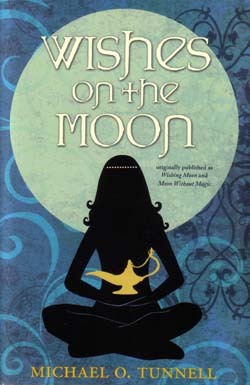 Wishing Moon (2004) and Moon Without Magic (2007) are combined in paperback format to tell the enchanting story of a young orphan, a street urchin/storyteller, a kindly cook, a handsome baker, an evil princess, and their adventures with a tricky jinni and his magic lamp. Unaware of its magical powers, Aladdin's selfish wife, Princess Badr al—Badur, throws an old dented lamp at a fourteen—year—old orphan girl, who begs for work in the Sultan's palace. Much to Aminah's surprise, the lamp contains a jinni, who grants her three wishes at the rise of each full moon. Aminah uses the wishes to improve her circumstances, but differs from previous masters in that she also helps her suffering people. Jinni is surprised by her generosity and begins to change his opinion of greedy and selfish humans. Together they aid a tailor, who is raising dozens of orphans, help a young baker struggling to feed the poor, enable a cinder girl to win her prince in spite of a mean stepmother and stepsisters, and rescue a young child from a wicked uncle. When Princess Badr discovers the lamp's value, she stops a nothing to reclaim it and take revenge on Aminah. Relying on their common sense, luck, and the lamp's magical powers, Aminah and her friends outwit desert robbers, escape thieving pirates, outsmart a vengeful princess, and finally realize that power to succeed requires responsibility, wisdom, and compassion. For readers who love great storytelling, good triumphing over evil, resourceful heroes and heroines, magical enchantments, intrigue, and a love story, this tale will provide hours of high adventure, suspense, romance, and the discovery that true happiness comes from helping others.